What can I say about Jules Verne that I haven't already said in November after reading "A Journey to the Centre of the Earth ?" Jules Verne is a master of adventure, something that would amaze you as a child and hopefully kindle your passion for books and stimulate your imagination. As an adult, the adventure still captivates me but I have discovered that I learn quite a lot about what was happening in history at the time. This novel is about the adventures of Phileas Fogg who attempts to travel around the world in 80 days in order to win a bet of 20,000 pounds sterling. The proposed route is London to Suez to Bombay to Calcutta (now Kolkata) to Hong Kong to San Francisco to New York to London. 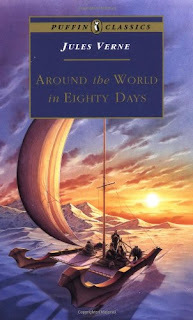 The trip takes every form of travel known to man, but I was surprised that this did not include a hot air balloon, as many versions of the novel have a picture of one on the cover. As I try to think about the moral of such a journey, I want to say that the reward for taking a journey is not what you get out of it in the end but of the journey itself. However, it seems that the end makes a case that the only reason why the journey was a success was due to the love of a good woman. Fogg in his travels cared very little about actually viewing the changes of scenery because his goal was only 'to be victorious' and not necessarily go on an adventure. Maybe there was something I missed, but the moral of the story wasn't my cup of tea... I would be curious to know a woman's take on this. The novel was full of dated material including opium use in China, racial slurs ('coolies', 'negroes', etc). There were interesting discussions on Mormons as well as their history including the Church of Latter Day Saints (I had recently read an article in National Geographic about this). I also enjoyed when buffaloes stampeded and stopped a train for several hours considering Americans nearly killed all that remained of the creatures. Their numbers are still recooperating centuries later. "Mr. Fogg stopped him, and, turning to Sir Francis Cromarty, said, "Suppose we save this woman." I found that fairly humorous, especially given the ending. In chapter 15 there was a trial that was held in such a rapid fashion, that I had to laugh on how much we have regressed despite the 'advancement' of our society. In addition, when Verne talked about how fast the railroad was build in America, I laughed thinking about how long such a job would take today with unions and general laziness of people. As I read I tried to think if Jules Verne had anything to say about globalization and the only thing I really took from it was that the English had made their stamp all over the world and had a large effect on the culture of the major port cities. This was discussed as if were an advancement of inferior societies, but with hindsight comes a different viewpoint altogether. As always, I wrote down quite a few terms and learned a few words which I will probably never use again... but hopefully I will detail a few in the coming days. All in all, I hope to eventually read at least one more work of Verne's: "20,000 Leagues Under the Sea." Despite Verne's material usually being dated, the sense of adventure and interesting take on history and science really intrigues me to him... but I find I must read this other work before I can truly comment, as it is well-known as his greatest book (and one of the 100 Greatest Books Ever Written by the Easton Press). I love Jules Verne - although would you believe I've never read this famous book? I went through a phase of reading lots of Verne and H.G. Wells, who - even though their writing styles are quite dissimilar in my opinion - are often parceled together as "great writers with a knack for envIsioning the future." Two lesser known novels of these two that I found interesting were "In the Days of the Comet" by Wells, and "The Begum's Fortune" by Verne. Neither are as strong as their more famous works, but I always enjoy these rarely visited nuggets of great writers. Great review. I've had a copy of Around the World in Eighty Days lying around for years, but I've never actually finished it. Your review made me think about giving it another try this 2011.